You are here: Home / Climate / How stupid do Gillard and Combet think we are? 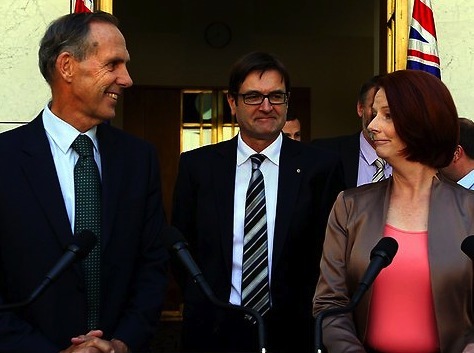 How stupid do Gillard and Combet think we are? Just how stupid does the prime minister and her climate minister think you are? Pretty damn stupid has to be the answer. There they both were yesterday, saying we want to hit you with a $10 billion tax, to pretty quickly grow to a $20 billion or $30 billion one. And we promise to give you back half of it. How persuasive can you get? We hand over $10 billion, they give us $5 billion back. And it just gets “better” as the tax rises. We hand over $20 billion, they give us back $10 billion. We hand over $40 billion, they give us back $20 billion. So this is what Ms Gillard means when she claims that people will be “better off”. Just focus on the $5 billion or $10 billion or more that you are “getting back”. You don’t need to worry about the $10 billion or $20 billion or more flowing to Canberra, because as Gillard and Combet keep claiming, you won’t be paying it. No, only the big so-called polluters will be paying the tax. Believe that and I have an opera house to throw in with the bridge I’ve got to sell you. They don’t think we’re stupid. More likely they think we have no memory retention. The many self-contradictory and inconsistent statements emitted by this government are sufficient proof of incompetence. They can’t even lie convincingly, or stand by any of their statements for longer than two weeks. According to Gillard, this is the way to run a country. Let’s not forget, this tax is being introduced in the name of (drum roll) CERTAINTY. Hooray ! And it’s worked : industry is now increasingly certain – about their opinion of this government ! This is just another communist ruse to extract money from the representatives of capitalism, to recoup the losses incurred by this disgraceful govenrment as a result of their reckless spending. This is how communist governments usually behave. To make it worse, they insult our intelligence by trying to make us believe that the majority of us are going to be better off. How long are we going to tolerate this? Enough is enough!!!!! They give Bernie Madoff a woody. In the history of politics there has never been a tax, imposed by a government, that has made its citizens ‘better off’. That statement is pure unadulterated spin and b.s. If I pay $100 to the Government’s carbon dioxide tax and they return $50 to me – how am I better off? I’ve still lost $50!!! This carbon dioxide tax will decimate our economy by making us uncompetitive with other countries. Just about all manufacturing will have a carbon dioxide tax impost that will be passed onto the consumer … petrol, electricity, gas, building materials, electrical goods, foods … the list is endless and in turn, that will cost jobs. There’s no backing down on this one. Either the Labor/Green alliance will be heading for political oblivion or our economy will be heading for financial oblivion! Actually it works a bit differently. All will pay, but some (an as yet undefined percentage) will be overcompensated. Over, because Gillard said the ‘poor’ will be better off. If one section of the nation will be better off, and only half of the tax is to be paid as compensation, then a sizeable chunk of Australian society will just pay, and have zero compensation. We mustn’t forget that Greg Combet, at Cancun promised the UN’s Green Climate fund an initial $597 million from Carbon dioxide taxes. What are the real motives? Well, Juliars/Brown tax on anything scheme is already in place and working well. Just substitute carbon for Tasmania and it explains where big chunk of our CURRENT tax we pay is disappearing. Labor always loves to follow communist doctrine punishing success and promoting failures. Brown Bob’s Tasmania is a shining example of Dole Bludging on Statewide scale. Whilst living off the rest of us they have all the time to come up with loony Marxist Utopia schemes to terrorise the hard working part of the Australia. By the way we are already paying something like 700 million dollars a year of our hard earned cash to rich people in poor countries under Gillar/Krudd’s carbon assitance scheme. This steeling was introduced by stealth without anyone’s approval and shows yeat another betrayal of Australian Families they love to talk about so much. Really? And who gets the rest? The United Nations, as part of the UN’s plan for the redistribution of economic wealth from rich countries to the bank accounts of dictators and corrupt governments in poor countries? These Labor politicians are insane. They make me sick. They should be charged for engaging in misleading and deceptive conduct. The Gillard government is not a government. It’s a bunch of rabble, making it up as it goes along… telling blatant lies… trying to deceive the public… treating the Australian public with contempt… oh, and wasting our hard earned tax payers money! It is pointless trying to keep the bastards honest. We have to get rid of the bastards!